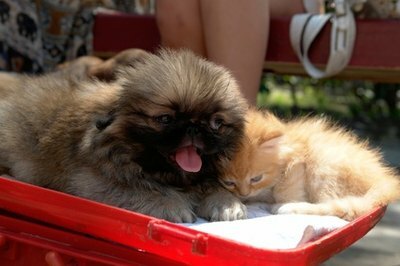 Some dogs will naturally love a new kitten, but a careful introduction is wise. Bringing a new kitten into a canine home can be either a loving reward for the entire family or an all-out tragic disaster. If a squirrel wouldn't stand a chance running through your backyard, you may want to reconsider a feline addition to your family. Confine the new cat to a small room. The room must have a litter box, food, fresh water and bedding. For two to three days, feed your dogs and cat next to the door of the room in which your cat is located. Move both the cat and dog food dishes close to the door so the animals are nose-to-nose while eating, with the door keeping them safely apart. Switch the animals so the dogs spend a day in the confined room. Keep the cat's bedding with the dogs so they can become familiar with the cat's scent. Do not move to the next step until the dogs and cat can eat calmly at the door. Put a leash on your dogs. If you have three dogs, ask three people to help you -- one person to handle each dog. Move the dogs to one side of a large room. Give your dogs the commands to sit and stay while praising their good behavior verbally and with treats. Have someone carry the cat into the room and stand in the area opposite the dogs. If the dogs stand up, calmly command them to sit and stay while offering treats. Remove the cat from the room and praise your dogs. Have the person return with the cat and praise your dogs with treats if they remain calm. Continue these steps several times. Move the cat closer to the dogs. Continue to praise your dogs for staying calm. If they stand up, redirect their attention by having them sit and stay. If your dogs or cat shows aggression, move back to opposite sides of the room and progress more slowly. Place your cat in a crate in the middle of the room. Keep your dogs on a leash as you walk around the crate. If one of the dogs tries pulling on the leash, make him sit or lie down. Have your dogs lie down near the crate and lavish them with attention. Scratch their backs, bellies and ears. Shower them with nutritious treats and enthusiastically praise them for excellent behavior. If your dogs are not displaying signs of aggression, move to the next step. Move your dogs to the opposite side of the room. Keep the leashes on the dogs and command them to sit and stay and give them all a treat. Have someone let the cat out of the crate. Allow the cat to walk around the room and even sniff the dogs. If your dogs ignore the cat or have a positive reaction to the cat, give them treats. If they stand up, redirect their attention with the commands to sit and stay. If your dogs are displaying no signs of aggression toward the cat, you can allow the cat and dogs to explore the room and each other freely. Make treats extra tasty and special during the introduction phase. Try pieces of cooked chicken or turkey hotdogs. This helps your dogs make positive associations with the new kitty. Many dogs eat cat poop, so keep the new cat's litter box away from your dogs. It's unlikely to make your dog sick, but it's still gross. Practice commands, such as sit, stay, down and come prior to introducing your dogs to the cat. It's important your dogs always follow your commands before introducing them to a cat. Signs your dog has a strong prey drive and is unlikely to adjust to the new cat include stiffness, intense focusing or staring, and barking or whining. Other signs of aggression include growling, lunging or snapping at a calm, quiet and confident cat. Do not attempt to control all dogs alone while introducing the cat. If you have three dogs, there should be four people involved: three people holding a leash for each dog and one person holding the cat. Can You Make a Cat Playful? What Kind of Room Should a New Kitty Spend Its First Night In? What Does a Five Week Old Kitten Need?